You’re a developer and you know AF_UNIX? You used it occasionally in your code, you know how high-level IPC puts marshaling on top and generally have a confident feeling when talking about it? But you actually have no clue what this fancy new kdbus is really about? During discussions you just nod along and hope nobody notices? This is how it should be! As long as you don’t work on IPC libraries, there’s absolutely no requirement for you to have any idea what kdbus is. But as you’re reading this, I assume you’re curious and want to know more. So lets pick you up at AF_UNIX and look at a simple example. By omitting the sun_path part of the address, we tell the kernel to pick one itself. This was easy. Now we’re ready to go so lets see how we can send a message to a peer. For simplicity, we assume we know the address of the peer and it’s stored in destination. That’s it. With this in place, we can easily send arbitrary messages between our peers. We have no length restriction, we can identify the peers reliably and we’re not limited by any marshaling. Sure, we now dropped error-handling, event-loop integration and ignored some nasty corner cases, but that can all be solved. The code stays mostly the same. Granted, the code will look slightly different. However, the concept stays the same. You still transmit raw messages, no marshaling is mandated. You can transmit credentials and file-descriptors, you can specify the peer to send messages to and you got to do that all through a single file descriptor. Doesn’t sound complex, does it? So if kdbus is actually just like AF_UNIX+SOCK_DGRAM, why use it? Messages are buffered in the receive-queue, which is relatively small. If you send a message to a peer with a full receive-queue, you will get EAGAIN. However, since your socket is not connected, you cannot wait for POLLOUT as it does not exist for unconnected sockets (which peer would you wait for?). Hence, you’re basically screwed if remote peers do not clear their queues. This is a really severe restriction which makes this model useless for such setups. There is no policy regarding who can talk to whom. In the abstract namespace, everyone can talk to anyone in the same network namespace. This can be avoided by placing sockets in the file system. However, then you lose the auto-cleanup feature of the abstract namespace. Furthermore, you’re limited to file-system policies, which might not be suitable. You can only have a single name per socket. If you implement multiple services that should be reached via different names, then you need multiple sockets (and thus you lose global message ordering). You cannot send broadcasts. You cannot even easily enumerate peers. You cannot get notifications if peers die. However, this is crucial if you provide services to them and need to clean them up after they disconnected. kdbus solves all these issues. Some of these issues could be solved with AF_UNIX (which, btw., would look a lot like AF_NETLINK), some cannot. But more importantly, AF_UNIX was never designed as a shared bus and hence should not be used as such. kdbus, on the other hand, was designed with a shared bus model in mind and as such avoids most of these issues. With that basic understanding of kdbus, next time a news source reports about the “crazy idea to shove DBus into the kernel”, I hope you’ll be able to judge for yourself. And if you want to know more, I recommend building the kernel documentation, or diving into the code. This entry was posted in Uncategorized on June 20, 2015 by David Herrmann. memfd: My most important project currently is memfd. We fixed several bugs and nailed down the API. It was also nice to get feedback from a lot of different projects about interesting use-cases that we didn’t think of initially. As it turns out, file-sealing is something a lot of people can make great use of. MiracleCast: For about half a year I worked on the first Open-Source implementation of Miracast. It’s still under development and only working Sink-side, but there are plans to make it work Client-side, too. Miracast allows to replace HDMI cables with wireless-solutions. You can connect your monitor, TV or projector via standard wifi to your desktop and use it as mirror or desktop-extension. The monitor is sink-side and MiracleCast can already provide a full Miracast stack for it. However, for the more interesting Source-side (eg., a Gnome-Desktop) I had a lot of interesting discussions with Gnome developers how to integrate it. I have some prototypes running locally, but it will definitely take a lot longer before it works properly. However, the current sink-side implementation has a latency of approx. 50ms and can run 30fps 1080p. This is already pretty impressive and on-par with proprietary solutions. kdbus: The new general-purpose IPC mechanism is already fleshed out, but we spent a lot of time fixing races in the code and doing some general code review. It is a very promising project and all of the criticism I’ve heard so far was rubbish. People tend to rant about moving dbus in the kernel, even though kdbus really has nearly nothing to do with dbus, except that it provides an underlying data-bus infrastructure. Seriously, the helpers used for kernel-mode-setting without including the driver-specific code is already much bigger than kdbus… and in my opinion, kdbus will make dbus a lot more efficient and appealing to new developers. GPU: GPU-switching, offload-GPUs and USB/wifi display-controllers are few of the many new features in the graphics subsystem. They’re mostly unsupported in any user-space, so we decided to change that. It’s all highly technical and the way how it is supposed to work is fairly obvious. Therefore, I will avoid discussing the details here. Lets just say, on-demand and live GPU-switching is something I’m making possible as part of GSoC this summer. User-bus: This topic sounds fairly boring and technical, but it’s not. The underlying question is: What happens if you log in multiple times as the same user on the same system? Currently, a desktop system either rejects multiple logins of the same user or treats them as separate, independent logins. The second approach has the problem that many applications cannot deal with this. Many per-user resources have to be shared (like the home-directory). Firefox, for instance, cannot run multiple times for the same user. However, no-one wants to prevent multiple logins of the same user, as it really is a nice feature. Therefore, we came up with a hybrid aproach which basically boils down to a single session shared across all logins of the same user. So if you login twice, you get the same screen for both logins sharing the same applications. The window-manager can put you on a separate virtual desktop, but the underlying session is basically the same. Now if you do the same across multiple seats, you simply merge both sessions of these seats into a single huge session with the screen mirrored across all assigned monitors. A more in-depth article will follow once the details have been figured out. A lot of the things I worked on deal with the low-level system and are hardly visible to the average Gnome user. However, without a proper system API, there’s no Gnome and I’m very happy the Gnome Foundation is acknowledging this by sponsoring my trip to SF: Thanks a lot! And hopefully I’ll see you again next year! This entry was posted in Uncategorized on June 10, 2014 by David Herrmann. Therefore, the most important question is why the hell do we need a third way? memfd_create does not require a local mount-point. It can create objects that are not associated with any filesystem and can never be linked into a filesystem. The backing memory is anonymous memory as if malloc(3) had returned a file-descriptor instead of a pointer. Note that even shm_open(3) requires /dev/shm to be a tmpfs-mount. Furthermore, the backing-memory is accounted to the process that owns the file and is not subject to mount-quotas. There are no name-clashes and no global registry. You can create multiple files with the same name and they will all be separate, independent files. Therefore, the name is purely for debugging purposes so it can be detected in task-dumps or the like. File-Sealing is used to prevent a specific set of operations on a file. For example, after you wrote data into a file you can seal it against further writes. Any attempt to write to the file will fail with EPERM. Reading will still be possible, though. The crux of this matter is that seals can never be removed, only added. This guarantees that if a specific seal is set, the information that is protected by that seal is immutable until the object is destroyed. This returns a signed 32bit integer containing the bitmask of currently set seals on fd. Note that seals are per file, not per file-descriptor (nor per file-description). That means, any file-descriptor for the same underlying inode will share the same seals. This takes a bitmask of seals in new_seals and adds these to the current set of seals on fd. F_SEAL_SEAL: This seal prevents the seal-operation itself. So once F_SEAL_SEAL is set, any attempt to add new seals via F_ADD_SEALS will fail. Files that don’t support sealing are initially sealed with just this flag. Hence, no other seals can ever be set and thus do not have to be enforced. F_SEAL_WRITE: This is the most straightforward seal. It prevents any content modifications once it is set. Any write(2) call will fail and you cannot get any shared, writable mappings for the file, anymore. Unlike the other seals, you can only set this seal if no shared, writable mappings exist at the time of sealing. F_SEAL_SHRINK: Once set, the file cannot be reduced in size. This means, O_TRUNC, ftruncate(), fallocate(FALLOC_FL_PUNCH_HOLE) and friends will be rejected in case they would shrink the file. F_SEAL_GROW: Once set, the file size cannot be increased. Any write(2) beyond file-boundaries, any ftruncate(2) that increases the file size, and any similar operation that grows the file will be rejected. Instead of discussing the behavior of each seal on its own, the following list shows some examples how they can be used. Note that most seals are enforced somewhere low-level in the kernel, instead of directly in the syscall handlers. Therefore, side effects of syscalls I didn’t cover here are still accounted for and the syscalls will fail if they violate any seals. IPC: Imagine you want to pass data between two processes that do not trust each other. That is, there is no hierarchy at all between them and they operate on the same level. The easiest way to achieve this is a pipe, obviously. However, to allow zero-copy (assuming splice(2) is not possible) the processes might decide to use memfd_create to create a shared memory object and pass the file-descriptor to the remote process. Now zero-copy only makes sense if the receiver can parse the data in-line. However, this is not possible in zero-trust scenarios as the source can retain a file-descriptor and modify the contents while the receiver parses it, causing any kinds of failure. But if the receiver requires the object to be sealed with F_SEAL_WRITE | F_SEAL_SHRINK, it can safely mmap(2) the file and parse it inline. No attacker can alter file contents, anymore. Furthermore, this also allows safe mutlicasts of the message and all receivers can parse the same zero-copy file without affecting each other. Obviously, the file can never be modified again and is a one-shot object. But this is inherent to zero-trust scenarios. We did implement a recycle-operation in case you’re the last user of an object. However, that was dropped due to horrible races in the kernel. It might reoccur in the future, though. Graphics-Servers: This is a very specific use-case of IPC and usually there is a one-way trust relationship from clients to servers. However, a server cannot blindly trust its clients. So imagine a client renders its window-contents into memory and passes a file-descriptor to that memory region (maybe using memfd_create) to the server. Similar to the previous scenario, the server cannot mmap(2) that object for read-access as the client might truncate the file simultaneously, causing SIGBUS on the server. A server can protect itself via SIGBUS-handlers, but sealing is a much simpler way. By requiring F_SEAL_SHRINK, the server can be sure, the file will never shrink. At the same time, the client can still grow the object in case it needs bigger buffers for growing windows. Furthermore, writing is still allowed so the object can be re-used for the next frame. As you might imagine, there are a lot more interesting use-cases. However, note that sealing is currently limited to objects created via memfd_create with the MFD_ALLOW_SEALING flag. This is a precaution to make sure we don’t break existing setups. However, changing seals of a file requires WRITE-access, thus it is rather unlikely that sealing would allow attacks that are not already possible with mandatory POSIX locks or similar. Hence, it is possible that sealing will expand to other areas in case people request it. Further seal-types are also possible. As of June 2014 the patches for memfd_create and sealing have been publicly available for at least 2 months and are considered for merging. linux-3.16 will probably not include it, but linux-3.17 very likely will. Currently, there’s still some issues to be figured out regarding AIO and Direct-IO races. But other than that, we’re good to go. This entry was posted in Uncategorized and tagged C, kdbus, kernel, linux, memfd, memfd_create, sealing, seals, syscall on June 10, 2014 by David Herrmann. For a long time connecting your TV or other external monitors to your laptop has always been a hassle with cables and drivers. Your TV had an HDMI-port, but your laptop only DVI, your projector requires VGA and your MacBook can only do DP. Once you got a matching adapter, you noticed that the cable is far to short for you to sit comfortably on your couch. Fortunately, we’re about to put an end to this. At least, that was my impression when I first heard of Miracast. Miracast is a certification program of the Wifi-Alliance based on their Wifi-Display specification. It defines a protocol to connect external monitors via wifi to your device. A rough description would be “HDMI over Wifi” and in fact the setup is modeled closely to the HDMI standard. Unlike existing video/audio-streaming protocols, Miracast was explicitly designed for this use-case and serves it very well. When I first heard of it about one year ago, I was quite amazed that it took us until late 2012 to come up with such a simple idea. And it didn’t take me long until I started looking into it. For 4 months now I have been hacking on wifi, gstreamer and the kernel to get a working prototype. Despite many setbacks, I didn’t loose my fascination for this technology. I did complain a lot about the hundreds of kernel dead-locks, panics and crashes during development and the never-ending list of broken wifi-devices. However, to be fair I got the same amount of crashes and bugs on Android and competing proprietary Miracast products. I found a lot of other projects with the same goal, but the majority was closed-source, driver-specific, only a proof-of-concept or limited to sink-side. Nevertheless, I continued pushing code to the OpenWFD repository and registered as speaker for FOSDEM-2014 to present my results. Unfortunately, it took me until 1 week before FOSDEM to get the wifi-P2P link working realiably with an upstream driver. So during these 7 days I hacked up the protocol and streaming part and luckily got a working demo just in time. I never dared pushing that code to the public repository, though (among others it contains my birthday, which is surprisingly page-aligned, as magic mmap offset) and I doubt it will work on any setup but mine.. The core of MiracleCast is a daemon called miracled. It runs as system-daemon and manages local links, performs peer-discovery on request and handles protocol encoding and parsing. The daemon is independent of desktop environments or data transports and serves as local authority for all display-streaming protocols. While Miracast will stay the main target, other competing technologies like Chromecast, Airtame and AirPlay can be integrated quite easily. The miraclectl command-line tool can be used to control the daemon. It can create new connections, modify parameters or destroy them again. It also supports an interactive mode where it displays events from miracled when they arrive, displays incoming connection attempts and allows direct user-input to accept or reject any requests. miracled and miraclectl communicate via DBus so you can replace the command-line interface with graphical helpers. The main objects on this API are Links and Peers. Links describe local interfaces that are used to communicate with remote devices. This includes wifi-devices, but also virtual links like your local IP-Network. Peers are remote devices that were discovered on a local link. miracled hides the transport-type of each peer so you can use streaming protocols on-top of any available link-type (given the remote side supports the same). Therefore, we’re not limited to Wifi-P2P, but can use Ethernet, Bluetooth, AP-based Wifi and basically any other transport with an IP layer on top. This is especially handy for testing and development. Local processes can now register Sources or Sinks with miracled. These describe capabilities that are advertised on the available links. Remote devices can then initiate a connection to your sink or, if you’re a source, you can connect to a remote sink. miracled implements the transmission protocol and hides it behind a DBus interface. It routes traffic from remote devices to the correct local process and vice versa. Regardless of whether the connection uses Miracast, Chromecast or plain RTSP, the same API is used. The main target still is Miracast! While all the APIs are independent of the protocol and transport layer, I want to get Miracast working as it is a nice way to test interoperability with Android. And for Miracast, we first need Wifi-P2P working. Therefore, that’s what I started with. The current miracled daemon implements a fully working Wifi-P2P user-space based on wpa_supplicant. Everyone interested is welcome to give it a try! Everything on top, including the actual video-streaming is highly experimental and still hacked on. But if you hacked on Miracast, you know that the link-layer is the hard part. So after 1 week of vacation (that is, 1 week hacking on systemd!) I will return to MiracleCast and tackle local sinks. As I have a lot more information than I could possible summarize here, I will try to keep some dummy-documentation on the wiki until I the first project release. Please feel free to contact me if you have any questions. Check out the git-repository if you want to see how it works! Note that MiracleCast is focused on proper desktop integration instead of fast prototyping, so please bear with me if API design takes some time. I’d really appreciate help on making Wifi-P2P work with as many devices as possible before we start spending all our efforts on the upper streaming layers. During the next weeks, I will post some articles that explain step by step how to get Wifi-P2P working, how you can get some Miracast protoypes working and what competing technologies and implementations are available out there. I hope this way I can spread my fascination for Miracast and provide it to as many people as possible! This entry was posted in Uncategorized and tagged Miracast, P2P, Wifi, Wifi Direct on February 17, 2014 by David Herrmann. While most devices of the 3 major x86 desktop GPU-providers have GPU and display-controllers merged on a single card, recent development (especially on ARM) shows that rendering (via GPU) and mode-setting (via display-controller) are not necessarily bound to the same device. To better support such devices, several changes are being worked on for DRM. In the following sections, I want to look closer at each of these points and describe what has been done and what is still planned to overcome these restrictions. This is a highly technical description of the changes and serves as outline for the Linux-Plumbers session on this topic. I expect the reader to be familiar with DRM internals. While render-nodes have been discussed since 2009 on dri-devel, several mmap-related security-issues have prevented it from being merged. Those have all been fixed and 3-days ago, the basic render-node infrastructure has been merged. While it’s still marked as experimental and hidden behind the drm.rnodes module parameter, I’m confident we will enable it by default in one of the next kernel releases. So whenever an application wants hardware-accelerated rendering, GPGPU access or offscreen-rendering, it no longer needs to ask a graphics-server (via DRI or wl_drm) but can instead open any available render node and start using it. Access-control to render-nodes is done via standard file-system modes. It’s no longer shared with mode-setting resources and thus can be provided for less-privileged applications. It is important to note that render-nodes do not provide any new APIs. Instead, they just split a subset of the already available DRM-API off to a new device-node. The legacy node is not changed but kept for backwards-compatibility (and, obviously, for mode-setting). It’s also important to know that render-nodes are not bound to a specific card. While internally it’s created by the same driver as the legacy node, user-space should never assume any connection between a render-node and a legacy/mode-setting node. Instead, if user-space requires hardware-acceleration, it should open any node and use it. For communication back to the graphics-server, dma-buf shall be used. Really! Questions like “how do I find the render-node for a given card?” don’t make any sense. Yes, driver-specific user-space can figure out whether and which render-node was created by which driver, but driver-unspecific user-space should never do that! Depending on your use-cases, either open any render-node you want (maybe allow an environment-variable to select it) or let the graphics-server do that for you and pass the FD via your graphics-API (X11, wayland, …). So with render-nodes, kernel drivers can now provide an interface only for off-screen rendering and GPGPU work. Devices without any display-controller can avoid any mode-setting nodes and just provide a render-node. User-space, on the other hand, can finally use GPUs without requiring any privileged graphics-server running. They’re independent of the kernel-internal DRM-Master concept! The initial idea (and Ilija Hadzic’s follow-up) to support this were mode-setting nodes. A privileged ioctl on the control-node would allow applications to split mode-setting resources across different device-nodes. You could have /dev/dri/modesetD1 and /dev/dri/modesetD2 to split your KMS CRTC and Connector resources. An XServer could use one of these nodes to program the now reduced set of resources. We would have one DRM-Master per node and we’d be fine. We could remove the CAP_SYS_ADMIN restriction and instead rely on file-system access-modes to control access to KMS resources. Another discussed idea to avoid creating a bunch of file-system nodes, is to allocate these resources on-the-fly. All mode-setting-resources would now be bound to a DRM-Master object. An application can only access the resources available on the DRM-Master that it is assigned to. Initially, all resources are bound to the default DRM-Master as usual, which everyone gets assigned to when opening a legacy node. A new ioctl DRM_CLONE_MASTER is used to create a new DRM-Master with the same resources as the previous DRM-Master of an application. Via a DRM_DROP_MASTER_RESOURCE an application can drop KMS resources from their DRM-Master object. Due to their design, neither requires a CAP_SYS_ADMIN restriction as they only clone or drop privileges, they never acquire new privs! So they can be used by any application with access to the control node to create two new DRM-Master resources and pass them to two independent XServers. These use the passed FD to access the card, instead of opening the legacy or mode-setting nodes. From the kernel side, the only thing that changes is that we can have multiple active DRM-Master objects. In fact, per DRM-Master one open-file might be allowed KMS access. However, this doesn’t require any driver-modifications (which were mostly “master-agnostic”, anyway) and only a few core DRM changes (except for vmwgfx-ttm-lock..). The previous two chapters focused on user-space APIs, but we also want the kernel-internal infrastructure to account for split hardware. However, fact is we already have anything we need. If some hardware exists without display-controller, you simply omit the DRIVER_MODESET flag and only set DRIVER_RENDER. DRM core will only create a render-node for this device then. If your hardware only provides a display-controller, but no real rendering hardware, you simply set DRIVER_MODESET but omit DRIVER_RENDER (which is what SimpleDRM is doing). Yes, you currently get a bunch of unused DRM code compiled-in if you don’t use some features. However, this is not because DRM requires it, but only because no-one sent any patches for it, yet! DRM-core is driven by DRM-driver developers! There is a reason why mid-layers are frowned upon in DRM land. There is no group of core DRM developers, but rather a bunch of driver-authors who write fancy driver-extensions. And once multiple drivers use them, they factor it out and move it to DRM core. So don’t complain about missing DRM features, but rather extend your drivers. If it’s a nice feature, you can count on it being incorporated into DRM-core at some point. It might be you doing most of the work, though! This entry was posted in Uncategorized and tagged dma-buf, DRM, DRM-Master, gem, GPU, kernel, KMS, linux, LinuxPlumbersConf, mode-setting-nodes, modesetting, render-nodes, TTM on September 1, 2013 by David Herrmann. In a previous article I talked about the history of VT switching. Created as a simple way to switch between text-mode sessions it has grown into a fragile API to protect one testosterone monster (also called XServer) from another. XServers used to poke in PCI bars, modified MMIO registers and messed around with DMA controllers. If they hauled out the big guns, it was almost absurd to believe a simple signal-flinging VT could ever successfully negotiate. Fortunately, today’s XServer is a repentant sinner. With common desktop hardware, all direct I/O is done in the kernel (thanks KMS!) and chances of screwing up your GPUs are rather minimal. This allows us to finally implement proper device-handover during session-switches. If we look at sessions at a whole, the XServer isn’t special at all. A lot of session-daemons may run today that provide some service to the session as a whole. This includes pulseaudio, dbus, systemd –user, colord, polkit, ssh-keychain, and a lot more. All these daemons don’t need any special synchronization during session-switch. So why does the XServer require it? Any graphics-server like the XServer is responsible of providing access to input and graphics devices to a session. When a session is activated, they need to re-initialize the devices. Before a session is deactivated, they need to cleanup the devices so the to-be-activated session can access them. The reason they need to do this is missing infrastructure to revoke their access. If a session would not cleanup graphics devices, the kernel would prevent any new session from accessing the graphics device. For input devices it is even worse: If a session doesn’t close the devices during deactivation, it would continue reading input events while the new session is active. So while typing in your password, the background session might send these key-strokes to your IRC client (which is exactly what XMir did). What we need is a kernel feature to forcibly revoke access to a graphics or input device. Unfortunately, it is not as easy at it sounds. We need to find some-one who is privileged and trusted enough to do this. You don’t want your background session to revoke your foreground session’s graphics access, do you? This is were systemd-logind enters the stage. systemd-logind is already managing sessions on a system. It keeps track on which session is active and sets ACLs in /dev to give the foreground session access to device nodes. To implement device-handover, we extend the existing logind-API by a new function: RequestDevice(deviceNode). A graphics-server can pass a file-system path for a device-node in /dev to systemd-logind, which checks permissions, opens the node and returns a file-descriptor to the caller. But systemd-logind retains a copy of the file-descriptor. This allows logind to disable it as long as the session is inactive. During a session-switch, logind can now disable all devices of the old session, re-enable the devices of the new session and notify both of the session-switch. We now have a clean handover from one session to the other. With this technology in place, we can start looking at real scenarios. Based on the graphs for VT-switching, I drew a new one considering logind. 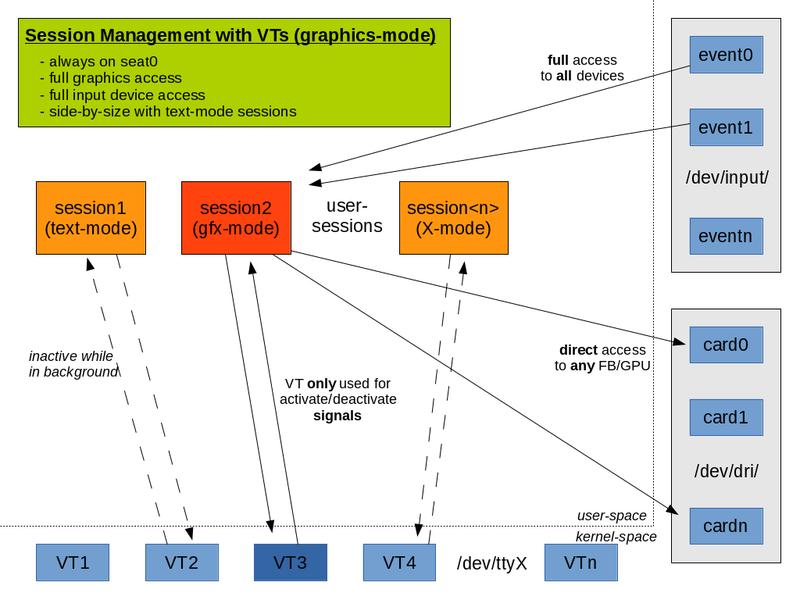 VTs are still used to switch between sessions, but sessions no longer open hardware devices directly. Instead, they ask logind as described above. The big advantage is that VT-switches are no longer fragile. If a VT is active, it can be sure that it has exclusive hardware-access. And if a session is dead-locked, we can force a VT-switch and revoke their device-access. This allows to recover from situations where your XServer hangs without SSH’ing from a remote machine or using SysRq. 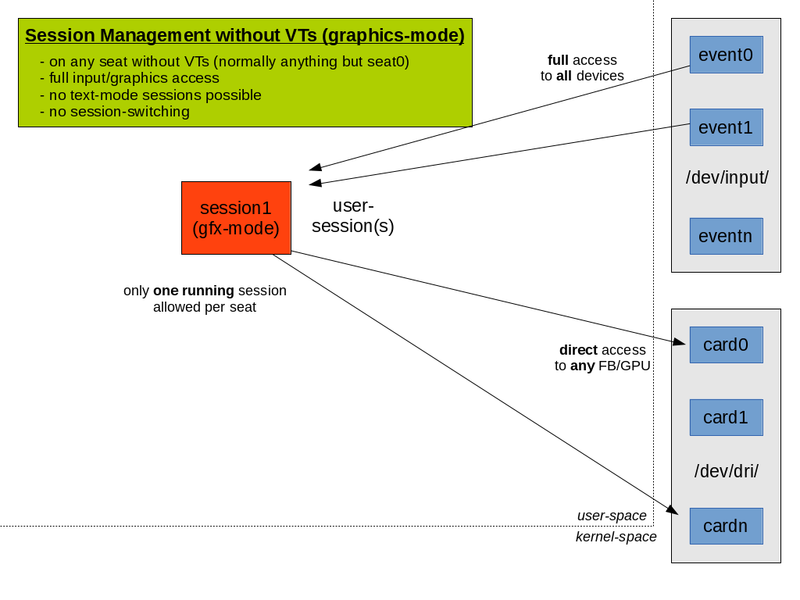 While sane VT-switching is a nice feature, the biggest win is that we can implement proper multi-session support for seats without VTs. While previously only a single session could run on such seats, with logind device-management, we can now support session-switching on any seat. Instead of using VTs to notify sessions when they are activated or deactivated, we use the logind-dbus-API. A graphics-server can now request input and graphics devices via the logind RequestDevice API and use it while active. Once a session-switch occurs, logind will disable the device file-descriptors and switch sessions. A dbus signal is sent asynchronously to the old and new session. The old session can stop rendering while inactive to save power. One thing changes almost unnoticed when using RequestDevice. An active graphics-server might be almost about to display an image on screen while a session-switch occurs. logind revokes access to graphics devices and sends an asynchronous event that the session is now inactive. However, the graphics-server might not have received this event, yet. Instead, it tries to invoke a system-call to update the screen. But this will fail with EACCES or EPERM as it doesn’t have access to it, anymore. Currently, for most graphics servers this is a fatal error. Instead of handling EACCES and interpreting it as “this device is now paused”, they don’t care for the error code and abort. We could fix all the graphics-servers, but to simplify the transition, we introduced negotiated session-switches. Whenever logind is asked to perform a session-switch, it first sends PauseDevice signals for every open device to the foreground graphics-server. This must respond with a PauseDeviceComplete call to logind for each device. Once all devices are paused, the session-switch is performed. If the foreground session does not respond in a timely manner, logind will forcibly revoke device access and then perform the session-switch, anyway. Note that negotiated session-switches are only meant for compatibility. Any graphics-server is highly encouraged to handle EACCES just fine! All my local tests ran fine so far, but all this is still under development. systemd patches can be found at github (frequently rebased!). Most tests I do rely on an experimental novt library, also available at github (I will push it during next week; this is only for testing!). Feedback is welcome! The RFC can be found on systemd-devel. Now I need a day off.. This entry was posted in Uncategorized and tagged device, evdev, linux, logind, session switching, sessions, systemd, virtual terminal, VT, xserver on August 25, 2013 by David Herrmann. Having multiple sessions on your system in parallel is a quite handy feature. It allows things like Fast User Switching or running two different DEs at the same time. Especially graphics developers like it, because they can test-run their experimental XServer/weston on the same machine they develop on. To understand how it works, we need the concept of a session. See my previous introduction into session-management if you’re not familiar with it. I expect the reader to be familiar with basic session-management concepts (i.e., seats, systemd-logind, login-sessions, user-sessions, processes and daemons in a session). Virtual terminals were introduced with linux-0.12. It’s the origin of multi-session support on linux. Before this, linux only supported a single TTY session (which was even available in the first tarball of linux-0.01). With virtual terminals, we have /dev/tty<num> devices, where <num> is between 1 and 63. They are always bound to seat0 and every session on seat0 is bound to a single VT. That means, there are at most 63 live sessions on seat0. Only one of them is active at a time (which can be read from /sys/class/tty/tty0/active). The kernel listens for keyboard events and switches between VTs on ctrl+alt+Fx shortcuts. Alternatively, you can issue a VT_ACTIVATE ioctl to politely ask the kernel to switch sessions. In the old days, all sessions ran in text-mode. In text-mode, a process can get keyboard input by reading from a VT and can write onto the screen by writing to a VT. Some rather ugly control-sequences are supported to allow colors or other advanced features. The kernel interprets these and instructs the graphics hardware to print the given text. Important to note is that in text-mode sessions don’t have direct hardware access. The kernel merges all keyboard events into one stream and a session cannot tell which device it came from. In fact, it cannot even tell how many devices there are. Same for graphics devices. As a VT has only a single output stream, there is only a single screen to write to. Multi-head support is not available. Neither are any advanced graphics-operations. But this allows the kernel to serialize access to hardware devices. Only the active VT gets input events and only the buffer of the active VT is displayed on the screen. No resource-conflicts can occur. While there are ways to detect when a session is activated/deactivated, in text-mode a session normally doesn’t care. It just stops receiving keyboard input. If the session writes to the VT while deactivated, it will affect the internal buffer of the VT, but not the screen. Only the buffer of the active VT is shown on screen. Very soon it became clear that text-mode is not enough. We wanted more! That’s when the VT graphics mode was introduced. Graphics mode doesn’t change the setup, we still have 63 VTs and each session is bound to a VT. But a VT can now be switched from text-mode KD_TEXT into graphics-mode KD_GRAPHICS (via KDSETMODE ioctl). This doesn’t do anything spectacular. Really! The only effect is it disables the kernel-internal graphics routines. As long as a VT is in graphics-mode, the kernel will not instruct the graphics hardware to display the VT on screen. Once it is reset to text-mode and the VT is active, the kernel will display it again. So the graphics-mode itself is useless. But at the same time, the kernel started providing separate interfaces to input and graphics devices. So while a VT is in graphics-mode, a session can access the graphics devices directly and render whatever they want. It can also ignore input from the VT and instead read input-events directly from the input-event interfaces. This is how the XServer works today. But it is pretty obvious that this becomes problematic during session switches. If the kernel switches away from a graphics VT, the session needs to release the graphics hardware before the new session can be activated. Otherwise, the new session is active, but you still get the images from the old one. Or worse, it might flicker between the images of both sessions. Without kernel-mode-setting it might even hang your graphics hardware. Unfortunately, the kernel has no interface to forcibly revoke graphics or input access. 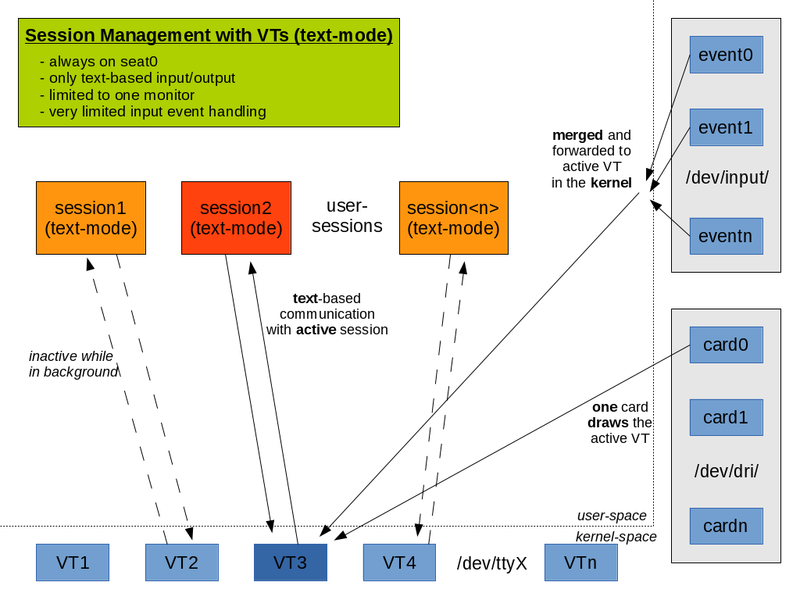 So VTs were extended by the VT_SETMODE ioctl. A process can issue VT_SETMODE on a VT and pass two signal-numbers (usually SIGUSR1 and SIGUSR2). If the kernel wants to perform a VT-switch, it sends one such signal to the active VT. This VT can cleanup resources, stop using graphics/input devices and acknowledge the VT-switch via the VT_RELDISP ioctl. If the process dead-locked and doesn’t acknowledge the request, the VT-switch will not happen! This is why a crashed XServer can hang your system. But if it correctly issues the VT_RELDISP ioctl, the kernel will perform the VT-switch. Once the kernel switches back to the given VT it sends the second signal as notification that it is now active again. However, on every VT (precisely, on every session) only a single process can call VT_SETMODE. This already shows that the concept is flawed. For example, if the XServer takes the VT in posession for graphics and input devices, another audio-server in the session couldn’t do the same for audio-hardware. This applies to all other devices. An alternative involving logind is discussed in a followup article. We discussed that VTs are always bound to seat0. So if you run a session on a seat other than seat0 or if you disabled VTs entirely, then the situation becomes pretty simple: no multi-session support is available. This is enforced by systemd-logind so the active session can run without interruptions. Also important to note is that there is no text-mode. A session must run in graphics mode as the kernel facility to interpret text-commands is bound to VTs. 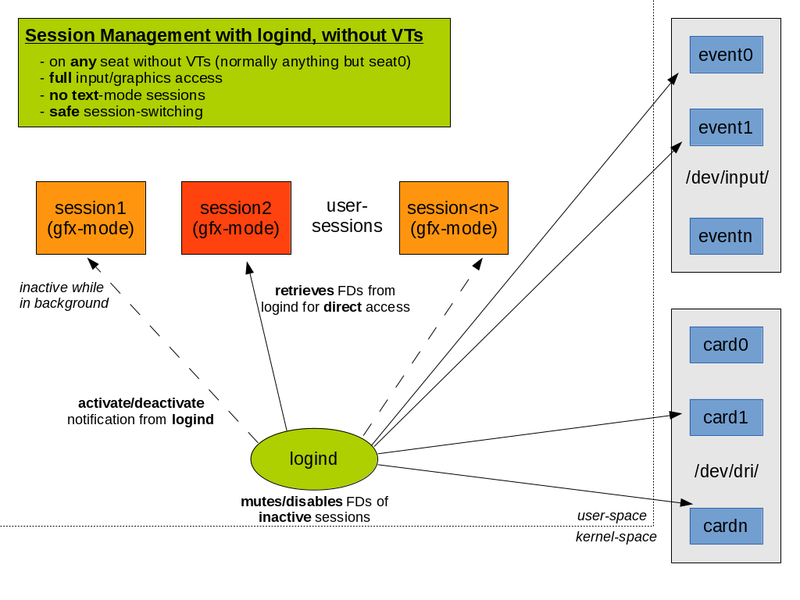 As we discussed in the previous article, today systemd-logind tracks and manages sessions. But how does this integrate with VTs? VTs pre-date systemd by years, so to preserve backwards-compatibility, we need to keep the infrastructure as it is. That’s why logind watches /sys/class/tty/tty0/active for changes. 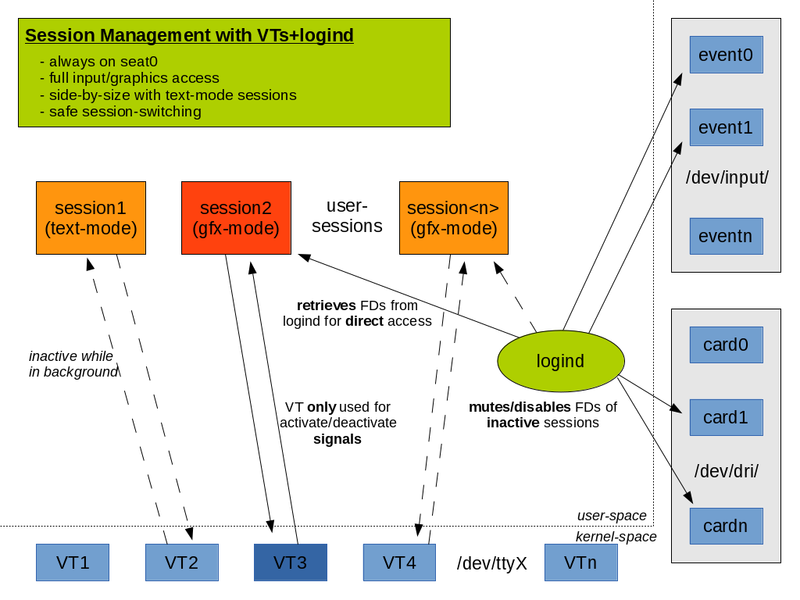 Once a VT switch happens, logind notices it and marks the old session as inactive and the new as active. It also adjusts ACLs in /dev to keep access-restrictions in sync with the active session. However, this cannot be done properly without a race-condition. Therefore, logind provides a new dbus-API to replace the ageing VT API. New session-daemons are advised to use it in favor of VTs. This entry was posted in Uncategorized and tagged graphics-mode, linux, logind, multi-seat, seats, session, session management, session-switch, systemd, text-mode, TTY, virtual terminal, VT, VT switch on August 24, 2013 by David Herrmann.